Just like Bitcoin, Litecoin is a blockchain based cryptocurrency that needs to be mined to produce new coins periodically. A blockchain is a chain of data blocks, and each block is numbered like the following, where block 0 was created by Charlie Lee manually, and after it, one Litecoin block is mined in every 2.5 minutes to provide new block space to store new transactions in the Litecoin network. After being mined, the new block is appended into the blockchain, making it one block longer. Beside storing new transactions, a new block is also accompanied by a certain amount of new Litecoins that are given to the miner who creates the new block. Block 0 had 50 new Litecoins rewarded to Charlie because he made the block on Oct. 7, 2011. 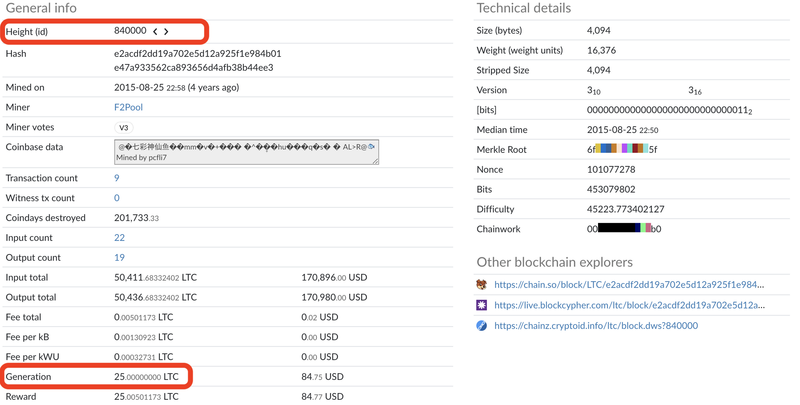 The 50-Litecoin reward remained in the following new blocks but then was halved to 25 Litecoins in Block 840000 on Aug. 25, 2015, which can be verified by checking the blockchain records shown below. Such reward halving occurs every 840000 blocks, which is approximately 840000 * 2.5 min ≈ 4 years. Therefore, the new halving will be likely to happen in Aug of this year, and the new coins generated for each block will be 12.5 LTC. Why can halving affect Litecoin price? Whenever new coins are generated through mining, it causes new sell pressure to the market because miners need to cash out to pay electricity bills and salaries, and thus Litecoin price can go lower if the demand does not catch up. When the mining reward is halved, there will be less sell pressure, and if the demand does not change, the chance of going downside will be lower. We can also look at halving from the inflation perspective. Before the incoming halving, the annual inflation rate is 8.96% and then reduced to 4.26% after halving. 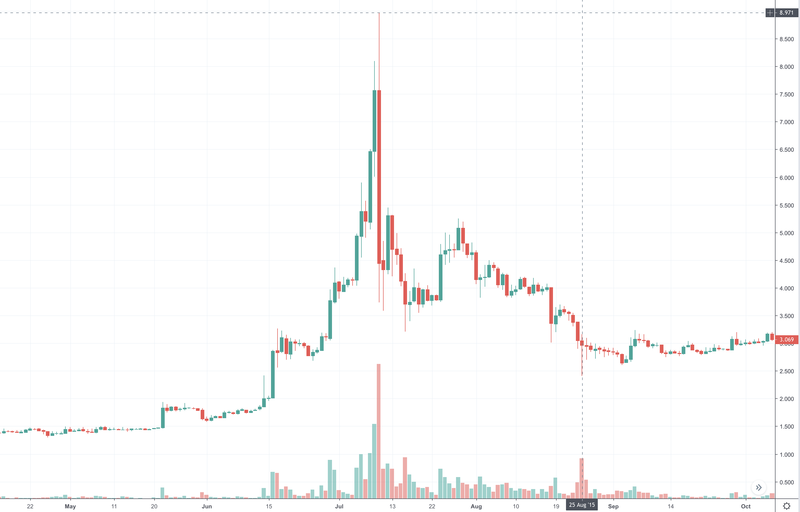 We can see in the following 2015 price chart that Litecoin price surged from $1 in May to $8.97 in July and then even after being dumped, the price kept at $3, which was 3 times before the halving. People speculated that this could happen again this year and claimed that the recent price surge was due to the incoming halving. Well, there is a lot of hype but it also makes economic sense to a certain extent. You need to make up your own mind. You can check the halving countdown on https://www.litecoinblockhalf.com/, which was created by Litecoin Core developer Adrian.